Kaylen returns from CSZ an award winner! Congratulations to MSc student Kaylen Brzezinski, who won the Holeton Award for best student poster at the Annual Meeting of the Canadian Society of Zoologists in St. Johns, Noufoundland. Kaylen's poster detailed the effects of chilling on the paracellular barriers of the locust gut epithelia. 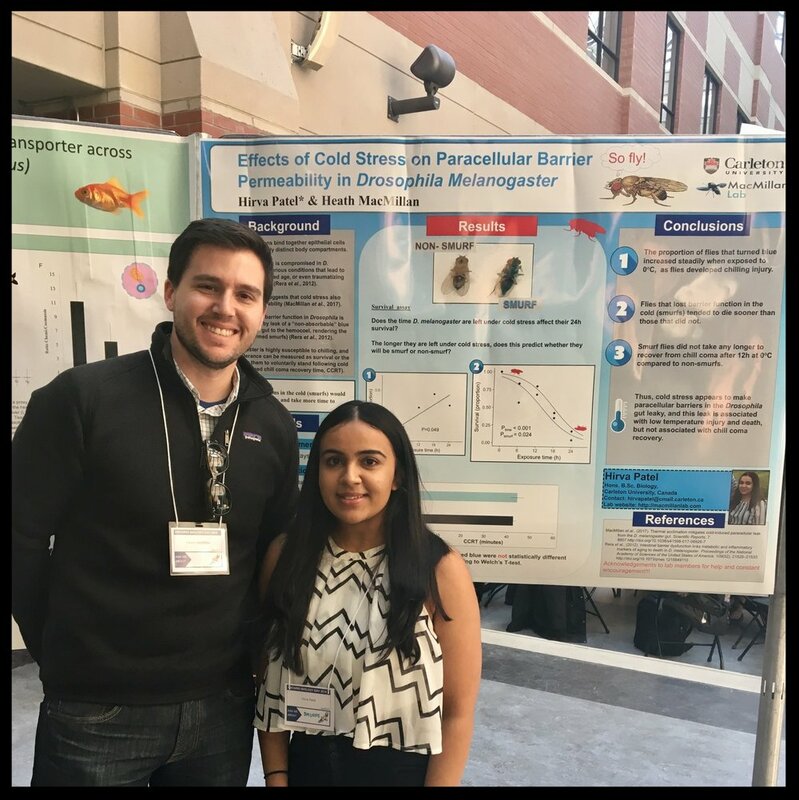 Hirva and Heath recently attended Ontario Biology Day in Waterloo, Ontario, where Hirva showed off her poster describing the effects of chilling on paracellar barriers in Drosophila melanogaster. Way to go Hirva! New manuscript in Scientific Reports shows how chilling makes fly guts leaky! A smooth septate junction (ladder-like structure) between two epithelial cells in the midgut of Drosophila melanogaster. A new paper from the lab in Scientific Reports shows how chilling disrupts paracellular barriers in the gut of Drosophila melanogaster. Heath, Gil, Sima, Scott, and Andrew teamed up to examine whether chilling simply slows transcellular ion and water transport, or if it also causes the septate junctions between epithelial cells to be disrupted. Not only does chilling disrupt gut barriers, but the ability to maintain gut barrier properties at low temperature is plastic; cold acclimation mitigates barrier disruption! A new paper by Lisa Jørgensen, Johannes Overgaard and myself is now in press at the Journal of Thermal Biology. Lisa was an undergraduate volunteer who found time to do an entire set of experiments in her spare time. Her hard work has now come to fruition! In order to clearly determine the mechansisms setting thermal limits, we need to understand the order in which different organs, tissues and biochemical processes fail at extreme temperatures. Here, Lisa shows that although exposing European green crabs to high temperatures causes them to lose ion balance, this loss of balance follows AFTER the crab is paralyzed and suffering from cardiac issues. Thus, a loss of extracellular ion balance does not cause paralysis, but might instead be a secondary consequence of tissue damage after a suite of physiological systems begin to shut down. Gil Yerushalmi aced his honours thesis defence and is ready to start as a MSc student in the Donini lab in September. Gil's honours thesis was on the effects of dietary salt intake on the cold tolerance of D. melanogaster, and will be submitted for publication this summer. Here is Gil with his poster at CSZ 2016 in May. He was a finalists for the Helen Battle Award against several seasoned MSc and PhD students. We are so proud!